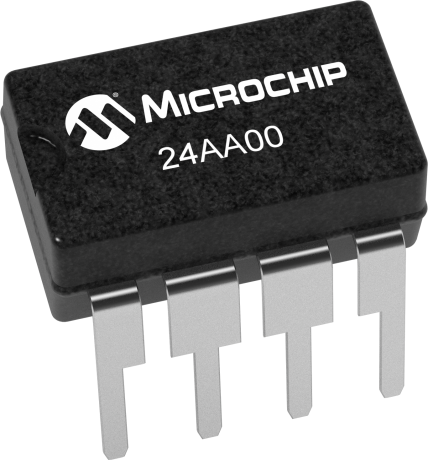 The Microchip Technology Inc. 24AA00/24LC00/ 24C00 (24XX00*) is a 128-bit Serial EEPROM organized as 16 x 8 with a 2-wire serial interface. Low-voltage design permits operation down to 1.8 volts for the 24AA00 version, and every version maintains a maximum standby current of only 1 µA and typical active current of only 500 µA. This device was designed for where a small amount of EEPROM is needed for the storage of calibration values, ID numbers or manufacturing information, etc. The 24XX00 is available in 8-pin PDIP, 8-pin SOIC (3.90 mm), 8-pin TSSOP, 8-pin 2x3 DFN and the 5-pin SOT-23 packages.